Perhaps no American metropolitan area has received more accolades for its smart city initiatives than San Diego. The city of 1.4 million people (more than 3 million if you count the surrounding areas) has garnered countless awards and was even the subject of a 2015 National Geographic documentary about the city’s efforts–the only American city to be so featured at the time. Indeed, the work the city is doing, including municipal projects, partnering with local innovators, and encouraging sustainable solutions and future mobility, continues to receive notice, including a 2018 Smart 50 Award. And it all started with a few lights. Well, more than just a few. 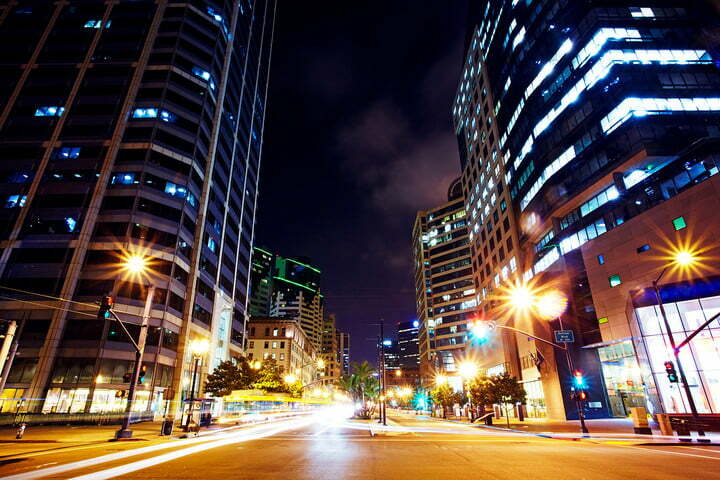 In 2014, San Diego started working with General Electric to install 3,000 LED streetlights with wireless network connections. The aim was to not just save energy and reduce greenhouse gas emissions. By networking the lights, the city was able to remotely control and monitor the street lighting, saving the city $250,000 a year in electricity and maintenance costs. But authorities understood that there are even more gains that could be realized from smart lighting. So now, San Diego has embarked on a project to install thousands of more intelligent streetlights–lights that can monitor parking spots, listen for criminal activity, and check air quality. Building out its own Internet of Things (IoT), some of the more advanced lights include Intel Atom processors, video cameras, microphones, Wi-Fi, Bluetooth, and sensors that can measure temperature, barometric pressure, humidity, and even magnetic fields. The added computing power can allow the smart lights to help drivers find open parking spaces and even tell traffic enforcement when vehicles are illegally parked. By opening up some of the information for public use, the city also hopes to encourage the development of apps to help local residents and visitors, such as a smartphone app for the visually impaired that could help them cross streets and navigate the city. Authorities are also considering the smart lights for other uses. For example, the lighting network could be integrated into the city’s existing ShotSpotter network. ShotSpotter is used by numerous municipalities to direct law enforcement to the location of gunfire, but San Diego’s IoT of lights could be used to vastly extend that network and improve accuracy. The city’s continuing effort, which recently garnered a 2018 Smart 50 Award for what is reported to be the world’s largest network of IoT sensors on city streetlights, involves the collaboration of the public and private sectors including GE, AT&T, and Qualcomm. Ultimately, the city plans to install more than 14,000 smart streetlights and hopes to reduce energy costs by $2.4 million a year. Across the whole county, San Diego says eventually it can save tax payers $4 million a year on better lighting solutions alone. The modern problems accompanying growth, such as traffic congestion, have not escaped San Diego. So, to combat the traffic problem the city’s department of transportation is working with private companies, such as Waze, to leverage information San Diegans can provide. Waze’s Connected Citizen Program is working with more than 600 municipalities around the world to deliver information not only about congestion but also about issues like the location of potholes, the location of dangerous deer crossings, and the potential impact of road closures. No new sensors are needed because the information is coming straight from Waze users’ smartphones. “With Waze, the drivers in the community are the eyes,” explained Thais Blumenthal de Moraes, who is in charge of global business development at the company. San Diego has also made smart efforts in improving other aspects of its transportation infrastructure. At the San Diego International Airport, for example, the Terminal 2 West Expansion was the first terminal project in the world to earn LEED Platinum and Envision-Platinum certifications. The Terminal 2 Parking Plaza boasts advanced parking guidance technologies and a storm water harvesting system. To support electric vehicles (EV), there are also charging stations and the municipality continues to work with companies such as EVgo, ChargePoint, Black & Veatch, and San Diego Gas and Electric (SDG&E). Indeed, the electrical grid is essential to San Diego’s plans to make its city smart–and sustainable. Over 30 percent of San Diego’s electricity is renewable, according to the city, and there’s no coal in SDG&E’s energy portfolio. Smart grid technology helps make this possible, increasing the use of renewable energy by intelligently and efficiently managing and balancing the region’s power demands. Perhaps no American city has received more accolades for its smart initiatives than San Diego. Naturally, as one of the country’s sunniest cities, boasting an average of 146 clear days a year, San Diego seems like the ideal place to become a net zero city. (Net zero means that the total amount of energy used by the city is equal to the amount of renewable energy it creates.) One example of such an effort is San Diego’s Solterra EcoLuxury Apartments, a smart living community solely based on solar power for all its 114 apartments. The development has garages that are wired for EV charging, virtual net metering displays that allow residents to monitor energy usage, and smart thermostats that can be programmed from anywhere, anytime by computer or smartphone. Solterra is the first all-solar apartment complex in San Diego, and the city hopes it’s just the beginning of a wave of a smart developments. Reducing power consumption and pollution through the use of intelligent systems extends to the Port of San Diego. To improve air quality, the city began by switching to a shore-power system that allows cargo ships to plug in at port rather than having to run their diesel engines at the dock. IoT efforts at the port started back in 2014 when the city began using sensors in buildings to detect energy consumption and give owners easy-to-manage, real-time data for reducing power consumption. The municipality also put sensors in trash bins, to see how future real-time data applications could facilitate more efficient collection and help keep the tideland clean. Out at Petco Park, home of the San Diego Padres baseball team, companies including OSIsoft, Qualcomm, and SDG&E are working on other IoT projects to help the Padres improve efficiencies at the facility. By using extensive data analytics, the park plans to closely monitor electricity, gas, and water use, which could reduce operational costs by more than 25 percent over the next five years. Indeed, one of the big benefits of such smart city projects is the information generated that can then be used to improve services and the quality of life for its citizens. San Diego’s Smart City Open Urban Platform (SCOUP) network, for example, automatically tracks and reduces greenhouse gas emissions from municipal facilities (SCOUP won a California Energy Commission Energy Innovation Challenge last year). The city continues to partner with a variety of companies and educational institutions, as well, such as working with Envision America to join with technology collaborators and businesses to address climate change and improve city services. It’s also working with the University of California in San Diego and the MetroLab Network, bringing together university researchers with city decision-makers to improve infrastructure and services. Fortunately, the area also has a history of research to draw upon. Just north of the city, in Torrey Pines, are the R&D divisions of many major companies, ranging from pharma firms like Novartis to aerospace companies like Northrop Grumman. Some of that research work focuses on future sources of energy, such as fusion reactors, and methods of transportation, such as the only working maglev train in the U.S., at General Atomics. (Maglev is the technology Elon Musk’s Boring Company proposes to use for its underground, high-speed trains.) General Atomics was also responsible for creating some of the first military drones. So it may not come as much of a surprise that San Diego recently became one of 10 municipalities in the country selected by the U.S. Department of Transportation and Federal Aviation Administration to be part of the Unmanned Aircraft System (UAS) Integration Pilot Program. The UAS program is intended to partner public and private sector organizations in projects designed to safely integrate the commercial use of drones into U.S. airspace. The city plans to conduct drone flights in the future that use detect-and-avoid technology, night vision, and package delivery systems. Future drones could be used to speed medical deliveries and assist first responders in helping those in need. It’s a future that for San Diego started with replacing some streetlights. That turned out to be a smart idea indeed.